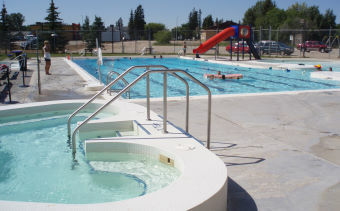 Located at 800 101st Street directly outside the South entry of the Tisdale RECplex, this outdoor facility opens on the Friday of the May long weekend and closes on the last Sunday prior to school opening in the fall. The Aquatic Centre is a six lane pool with a one-metre diving board, zero-entry beach area and a 20-person whirl pool. It also has a classroom, administration areas, ladies’, men’s and family change rooms, concession and equipment rooms. Chlorination is a lectranator salt system and the pool water is heated by a solar system. Programs include learn to swim lessons, lane swims, aquacize, public and family swims and private rentals. For more information please contact the Recreation and Parks office at 306-873-2154.